The Duke and Duchess of Sussex are expecting their first child in 2019. From the baby's due date, to potential names, to the child's royal title — we've got all the details covered. Prince Harry and Meghan, Duchess of Sussex, are currently awaiting the arrival of their first child — and so are faithful fans and eager royal watchers. Where will the baby be born? Will the child be a boy or a girl? A princess or an earl? What about names? When the new addition finally arrives, the mysteries will be put to rest. But there's no need to wait for the due date to get answers to some of those burning questions. When did former Meghan Markle announce her pregnancy? Many eyes were already on the Duke and Duchess of Sussex on Oct. 15, the day they set out on their first royal trip together — a two-week tour of Australia, New Zealand, Fiji and Tonga — but before they even stepped off their plane, they gave royal watchers another reason to look their way. Their royal highnesses announced they were expecting a baby "in the spring of 2019." Of course, "spring" could mean anywhere between March 20 and June 21, but thanks to the duchess herself, we can narrow the date down a little more. In January, she greeted well-wishers in Birkenhead, England, and struck up a conversation with a midwife in the crowd, telling her that they anticipate the baby will be here by "end of April, early May." While Kensington Palace has not yet provided an official announcement on a birthplace, there is one good guess to be had. Catherine, Duchess of Cambridge, delivered all three of her children at the Lindo Wing of St. Mary's Hospital in London. That's the same place Princess Diana gave birth to both her sons. But with a move outside of London on the way for Harry and Meghan, there's always a chance they'll select another hospital, such as Frimley Park in Surrey, where Sophie, Countess of Wessex, delivered her two children. What is the royal baby’s gender? Your guess is as good as theirs! During a night out at the Endeavour Fund Awards in London on Feb. 7, the mom-to-be revealed that even she and Prince Harry have no idea of the gender. "We don't know," she told one attendee. "Yes, we decided to keep it a secret" — as is tradition for most births in the British royal family. Could the duchess be carrying twins? In the fall, royal baby buzz took a turn from "What will they have?" to "How many?" Some wondered this based on the size and shape of the duchess's baby bump, but serious talk about the possibility of twins kicked off in late November when an Irish betting company called Paddy Power announced that all bets were off — officially — after a sudden surge in people putting their money on multiples. "An unprecedented amount of bets on Meghan and Harry to have twins has forced us to stop taking bets on the market altogether," a spokesperson for Paddy Power told TODAY in a statement. "Since the day began, the stream of bets has led us to believe that perhaps the punters — or an insider source — knows something more than we do." The odds reached 5-to-1 in favor of twins before the bets were cancelled. Baby names have been a topic of conversation for the expectant parents ever since, well, they revealed that they are expectant parents. It started during their tour of Australia, in which well-wishers of all ages offered suggestions, such as Rachel (which is actually the duchess's first name), Michael and a feminine take on Harry's own name — Harriet. The fan favorites are always politely received, though royals tend to choose from a traditional selection of family names. For a girl, Alice, Diana, Mary, Victoria and Elizabeth are popular frontrunners among bookies and fans. For a boy, James, Arthur, Alexander and Philip lead the options, while Harry's mother's maiden name, Spencer, makes many lists alongside them. Of course, the parents aren't limited to just one pick. Three or four — and sometimes even more — names make the cut. After all, Prince Harry is actually Henry Charles Albert David. What will be the royal baby's last name? Despite King George V adopting the surname Windsor for his lineage back in 1917, typically, members of the British royal family don't use a last name at all. However, sometimes they need one. When Prince Harry and his brother, Prince William, enrolled in school and military service, they used Wales, since their father is the Prince of Wales. Similarly, William's children use Cambridge, since he's now the Duke of Cambridge. So when a last name is needed for the baby on the way, it seems a safe bet that Sussex will fill blank. Where will the baby be christened? Many locations are available to the royals when it comes time to christen the baby. The queen herself was christened in the private chapel at Buckingham Palace, while Prince Charles and Prince William were both christened in the music room of the grand residence. Prince William's sons were both christened at Chapel Royal in St. James's Palace, and his daughter's ceremony was held at St. Mary Magdalene church on Queen Elizabeth’s Sandringham estate. But for the Duke and Duchess of Sussex, there's another location that might be a better fit: St. George's Chapel at Windsor Castle. 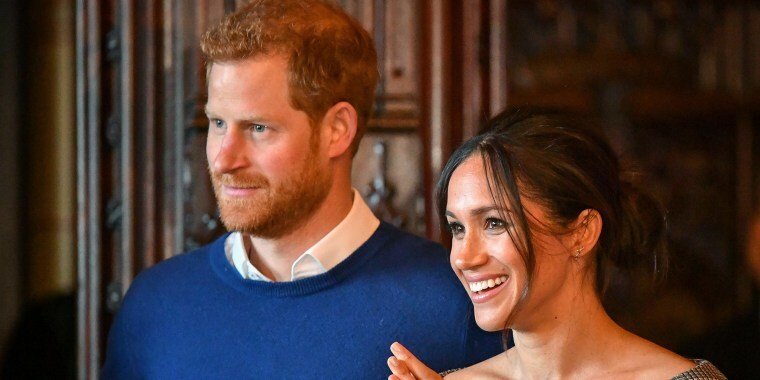 Not only is that where Harry was christened, but it's also where the couple wed — and, adding to the convenience, they plan to soon relocate to a cottage on the Windsor estate. Who will be the royal baby's godparents? While we won't know the names of the godparents-to-be for certain until just before the newest member of the royal family is christened, a little guesswork could go a long way. For instance, it would be no surprise if the Duchess of Sussex picked her BFF and stylist Jessica Mulroney as godmother. The two have been close for years, and Mulroney's children even had a role in the royal wedding. As for Prince Harry, his own longtime pal, Charlie van Straubenzee, wouldn't be an unexpected pick for godfather. They've known each other since their prep school days and have remained close family friends since. Of course, even if both of those predictions pan out, there could be others, too. As the Duke and Duchess of Cambridge have well established, there's no need to limit godparents to just two — Prince George has seven, Princess Charlotte has five and little Prince Louis has six of his own. What will the baby's royal title be? Prince Harry is officially His Royal Highness the Duke of Sussex, Earl of Dumbarton and Baron Kilkeel, while the former Meghan Markle is Her Royal Highness the Duchess of Sussex, Countess of Dumbarton and Baroness Kilkeel. But when it comes to their offspring, it gets a little more complicated. And by a little, we mean a lot. Again, the reason for that goes back to King George V and one of his 1917 decrees. In order to streamline the monarchy, he ruled that, of the monarch's great-grandchildren, only the eldest son (in this case Prince George) of the eldest son (Prince William) of the eldest son (Prince Charles) of a king or queen would automatically be given His Royal Highness (HRH) status. In recent years, Queen Elizabeth amended the decree to bestow the HRH to all of Prince William's children, which is why all three have their particular titles. But without intervention on behalf of Harry's future children, there's no HRH for them. As a Duke, the royal rules dictate that Harry can only hand down his dukedom to a son, who would have the title of an earl until then. And a daughter? She'd be a lady. Where does the royal baby fall in the line of succession? While it's highly unlikely that this baby will ever be a king or queen, the child will have a spot in the line of succession to the thrown — right after dad. Prince Harry is currently sixth in line, behind father Prince Charles, brother Prince William, nephew Prince George, niece Princess Charlotte and nephew Prince Louis. Harry's first offspring will be seventh. When was Meghan and Harry's wedding? On May 19, 2018, Meghan Markle became Prince Harry's wife — and thereby Meghan, Duchess of Sussex — when the two wed at St. George's Chapel at Windsor Castle. Is the royal baby the duchess's first child? Yes. This will be the first child for both Harry and his bride, however their union isn't the first marriage for Meghan. Back in 2011, when she was still an actress on the American TV show "Suits," she wed producer Trevor Engelson. The former couple divorced two years later. Is this the earliest a baby has been expected after a royal wedding? No. That distinction is held by Queen Victoria, who married Prince Albert on Feb. 10, 1840, and then gave birth to the first of their nine offspring 40 weeks and 5 days later, on Nov. 21, 1840. But the Duke and Duchess of Sussex could vie for second place. Princess Diana gave birth to Prince William 46 weeks and 5 days after she married Prince Charles on July 29, 1981. With Diana's daughter-in-law due in April (or early May), it's just a matter of what day the baby arrives. If the duchess gives birth on or before April 10, she'd take that second-place spot. How old will Meghan and Harry be when the baby is born? The former Meghan Markle was born on Aug. 4, 1981 (about five months before her sister-in-law, Catherine, Duchess of Cambridge), putting her at 37 years old when the new addition is expected to arrive. Prince Harry, born Sept. 15, 1984, will be age 34 when the baby comes. Will the Duchess of Sussex be the oldest first-time royal mom? No. The late Princess Alice, Duchess of Gloucester, who was married to the queen's uncle, Prince Henry, gave birth to her first child the week before her 40th birthday. And Sophie, Countess of Wessex, the wife of the queen's son Prince Edward, was 38 when she first became a mother. While baby Sussex will meet the appropriate requisites to become an American citizen — being born abroad in wedlock to a citizen who's resided in the U.S. for more than five years, two of which after age 14 — his or her parents would have to report the birth to the American consulate and submit documents to make it all official. However, they're unlikely to do that. Dual nationality would come with a requirement of allegiance to both nations, something that could be awkward for a baby born to Britain's own royal family. Where will Meghan and Harry live? They'll call Frogmore Cottage in Windsor home — and soon. In fact, the couple intends to relocate this year to the newly renovated estate, from their current home in Nottingham Cottage on the grounds of Kensington Palace, before the little one's arrival. Will Meghan and Harry have a nanny? Almost certainly. This is a tradition for most royals as parents juggle public duties, patronages and trips abroad. Also, reports claim that a nanny's quarters were part of the massive Frogmore Cottage renovation. Who are the grandparents of the royal baby? On Harry's side of the family, Prince Charles, as well as his late mother, Princess Diana, are the grandparents. Charles' current wife, Camilla, Duchess of Cornwall, will be a step-grandmother to the child. On Meghan's side, Doria Ragland will be grandmother and the duchess's father, Thomas Markle, will be grandfather — though given his estrangement from his daughter, it's unknown if he'll play any role in the child's life. Who are the cousins of the royal? Prince George, Princess Charlotte and Prince Louis will all be the baby's cousins, as will the duchess's two adult nephews, Tyler and Thomas, the sons of her half-brother, Thomas Markle Jr.
What number great-grandchild will the baby be for the queen? Baby Sussex will be great-grandchild No. 8 for Queen Elizabeth. In addition to Prince George, Princess Charlotte and Prince Louis, the queen is also great-grandma to Princess Anne's grandchildren, sisters Savannah and Isla Philips and sisters Mia and Lena Tindall.